Veterans Day is celebrated every November 11. Many restaurants and companies thank our veterans and actively serving military personnel for their service with a free meal or discounts. This year Veterans Day falls on a Friday, giving many people a three day weekend. What better way to start a three day weekend than with a Veterans Day deal?! The Military Wallet has the most extensive list of Free Veterans Day Meals, so check out that list for all the deals Ryan has found. Below I've curated the five BEST Veterans Day deals, discounts, and free meals. 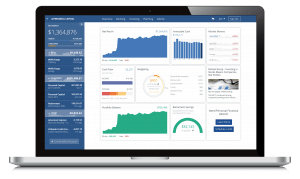 These are deals I actually have taken advantage of and I know you will get a quality experience. You will need some form of ID. Most companies require some form of military ID before giving you the discount. Usually a military ID card (Common Access Card, or CAC), VA ID Card, current Leave and Earnings Statement (LES) pay stub, drivers license with veterans designation, DD214, discharge paperwork, or going in uniform. Not all locations participate. Many chains and franchises that offer the Veterans Day free meals or discounted meals may not all participate. It never hurts to call ahead so you are not surprised when the check comes. Leave a nice tip! Tipping is the worst and tipping culture is sexist, racist, and classist, but that's an argument for another day. Until I complete my life long goal to get rid of tipping in the US, it's important to tip based on what the meal would have cost you before the discount. Don't stiff your waitress or waiter, they're still working just as hard whether your meal cost $100 or $0. Thank them with a nice tip! This isn't a right or a privilege, but a gesture of thanks. Yes, we're all thankful for your service. But if a corporation chooses not to participate in the Veterans Day discounts or doesn't have the item you wanted available, don't throw a hissy fit. Be gracious and thankful that some organizations and companies are giving you a discount and celebrating your service on Veterans Day. Grand Tetons National Park. Unreal! I took this photo when we visited in 2015. When is the last time you went to America's greatest natural asset? The US National Parks are some of the greatest natural beauty and wonder available and you don't even need to fly to get to most of them. Active duty, Guard, and Reserve US military personnel are entitled a free annual pass. You can pick up your pass wherever you pay entrance fees to a National Park. We've had a free pass for the past four years. 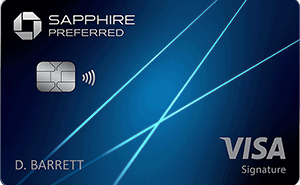 Dependents can also use the pass without the military servicemember present, which is handy when the SM is deployed. 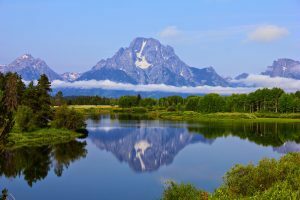 This deal is available year round and not just on Veterans Day, so take advantage of America the Beautiful and visit the National Parks for free. The National Park System is amazing and deserves a visit. Spend your three day weekend visiting a park! BJ's serves up standard American fare, kind of like a slightly classier Chili's. I've only dined there once out in Tacoma, Washington by the mall but it was an enjoyable lunch. This year they are offering up to a $12.95 entree for free to military vets and those still serving. Beers and ciders are also only $5 each, which raises the question of how much were they before the deal!? Regardless, a nice gesture of thanks from BJ's. More details here. Chili's is a reliable, family friendly dining experience available all over the US and even in Ramstein, Germany. Standard American fare with a little bit of Southwest influence. Chili's is offering any lunch combo or your choice of a dinner meal from a select menu. 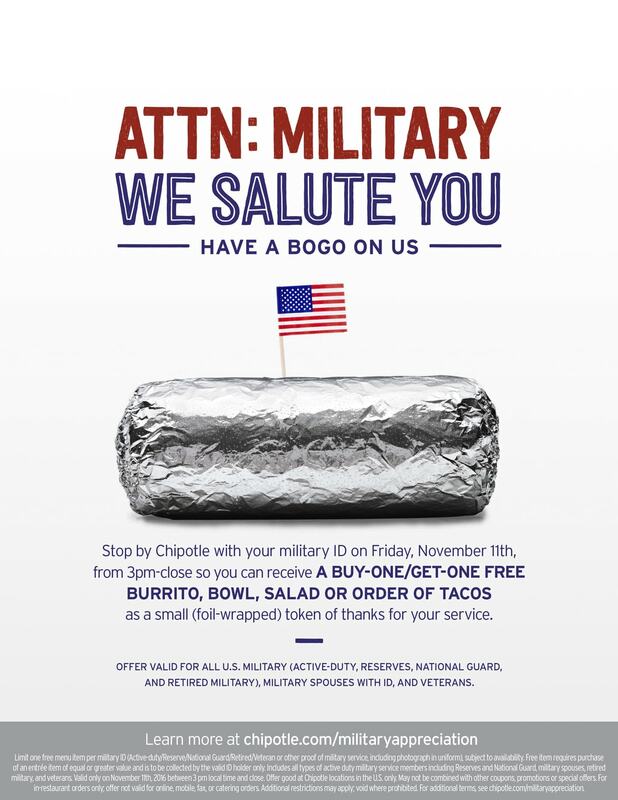 I took advantage of their free Veterans Day meal in 2010 and 2011 and it was both free and delicious. Some places are not participating in this deal, so make sure you call ahead before you go. Yes they've had some issues with their food quality in recent times but that's not going to stop you, is it? 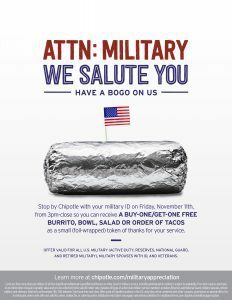 Chipotle is offering a Buy One Get One (BOGO) deal on burritos, salads, bowls, or tacos to military personnel on Veterans Day from 3pm until close. All locations should be participating. Click the ad for all the details. Red Robin is another family friendly, American style burger joint that's offering a free Red's Tavern Double burger and bottomless steak fries to all veterans and active duty military. What are your favorite Veterans Day deals or discounts? There are many out there, how many have you taken advantage of?